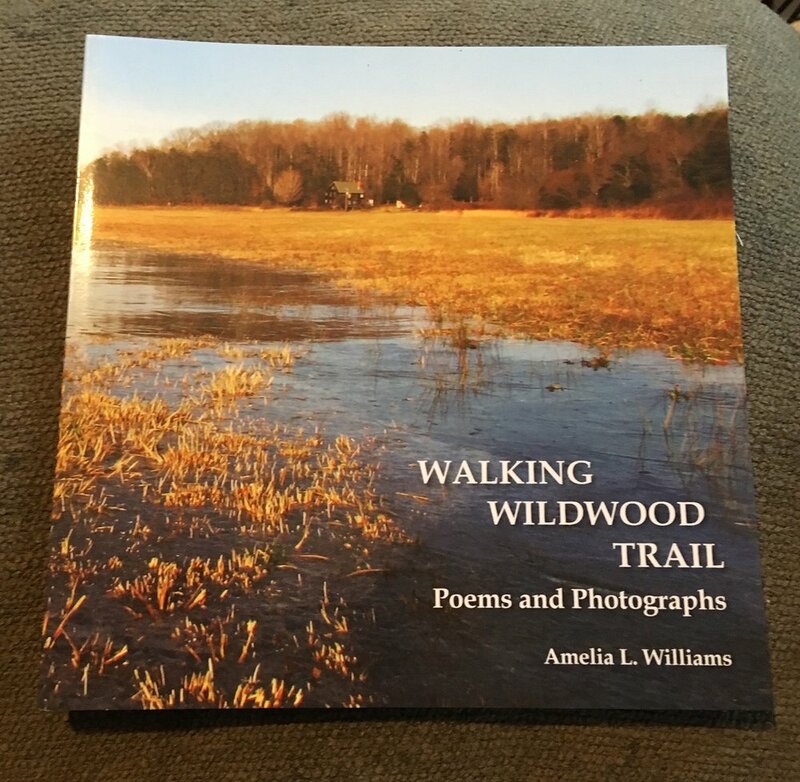 Amelia Williams is an artist/poet/activist from the Rockfish Valley area of Nelson County, Virginia, and author of Walking Wildwood Trail: Poems and Photographs. Walking Wildwood Trail is more than just a beautiful books of poems. It is a brilliant artful act of protest against the Atlantic Coast Pipeline. Amelia is planting copyrighted art works with poems incorporated into them along the pending path of the Atlantic Coast Pipeline and copyrighting the entire installation. When the proposed pipeline path was changed, another alarmed landowner contacted Amelia, and she started a second series of art installations. The newest project in Bath County consists of three parts in a large triangle, each separated by a thirty minute walk from the next, made of materials that include rocks, bone, copper pipe and jewelry parts. They represent the pipeline itself, the blast zone for construction, and the threatened homes. Williams decided to begin this creative journey when she read about Canadian artist Peter von Tiesenhausen, who waylaid a mining company when he registered his 800 acres as intellectual property in the form of land art. Now Amelia is teaching others how to do this, both the art and the copyright process, in an ongoing fight against the construction of this dangerous pipeline through farmlands, old growth woodlands, national forest, and near homes and schools. Buy Amelia’s Beautiful Book Here! Proceeds donated to Wild Virginia for the battle against construction.